400 pages | 9 B/W Illus. In recent years law, crime and justice have become increasingly politicised in Hong Kong. Understanding Criminal Justice in Hong Kong, 2nd Edition offers a detailed and comprehensive overview of and introduction to the criminal justice system in Hong Kong, building upon recent events and controversies. Invites readers to consider arguments and debates that surround the controversial issues in the Hong Kong criminal justice system. This book is a comprehensive resource for students studying this subject as part of a wider course in criminal justice, police studies, law or social work, and for practitioners working in Hong Kong in the police, prisons, probation, voluntary agencies and other criminal justice personnel. Text features include review questions, lists of cases cited, and useful websites. "Different regions need to explore their own understandings of crime and justice. In doing so, this book draws on an impressive range of contributors to provide an important overview of our understanding of criminalisation, the changing activities of criminal justice agencies and public responses to crime and justice at a key moment in the history of Hong Kong." "Informed by the latest research in the field, the editors and contributing authors help readers navigate some of the profound changes and challenges in the criminal law and processes of criminal justice in Hong Kong over the last decade or so. The book includes some important contributions relating to recent civil protests and the ‘Occupy Central’ movement, and offers some critical insights into power relations and the changing landscape of criminal justice. The book will serve as a comprehensive resource for students in a wide range of criminal justice, social work and related courses." 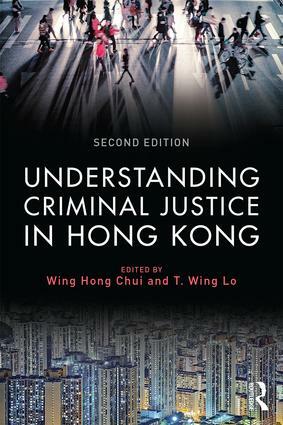 "I found the second edition of Understanding Criminal Justice in Hong Kong well researched and updated to the date of print. A most comprehensive text for anyone interested in Hong Kong 's criminal justice system." Wing Hong Chui is Professor in the Department of Applied Social Sciences, City University of Hong Kong. Prior to this, he was the Associate Dean (Undergraduate Education) of the Faculty of Social Sciences, the University of Hong Kong. His areas of interest include youth studies, social work, criminology and criminal justice. He has published articles in the Asian Journal of Criminology, Australian & New Zealand Journal of Criminology, British Journal of Criminology, European Journal of Criminology, International Journal of Offender Therapy and Comparative Criminology, and Theoretical Criminology. He is editor of several books, Moving Probation Forward (with Mike Nellis, 2003, Pearson Education), Social Work and Human Services Best Practice (with Jill Wilson, 2006, The Federation Press), and Research Methods for Law (with Mike McConville, 2007, Edinburgh University Press). He is also the author of The Hong Kong Legal System (with S.H.C. Lo, 2012, McGraw-Hill) and Responding to Youth Crime in Hong Kong: Penal Elitism, Legitimacy and Citizenship (with M. Adorjan, 2014, Routledge). T. Wing Lo is Professor of Criminology and Head of the Department of Applied Social Sciences at City University of Hong Kong. He received his M.Phil. from the University of Hull in 1984 and Ph.D. from the University of Cambridge in 1991. He had been employed as a youth gang worker for 17 years before he started university teaching in 1990. His research interests are triad societies, anti-corruption, youth gangs, outreach social work, group counselling and corrections. He is a member of editorial/advisory board of a number of journals, such as the Asian Journal of Criminology, British Journal of Community Justice, British Journal of Criminology, and Youth Justice.